In mid-August the U.S. had lean hogs in the mid 40’s. Losses were $40 per head. The difficult part to comprehend was it was mid-August and normally a time of profits. What was going to happen to process when we get to October-December usually the lowest prices of the year, 20’s – 30’s? Thankfully there was a price recovery and hogs have moved into the 60’s, not great, not profitable, but not a train wreck. Since Mid-August lean hog futures have increased substantially. December up 12₵; February up 15₵; April up 13₵; June up 12₵ – All up $25 -$30 per head. On Friday, June lean hog futures closed at 82.825 a life of contract high. The price movement higher certainly makes the future brighter with profit estimates over the next twelve months now averaging in the $15 – $20 per head range. 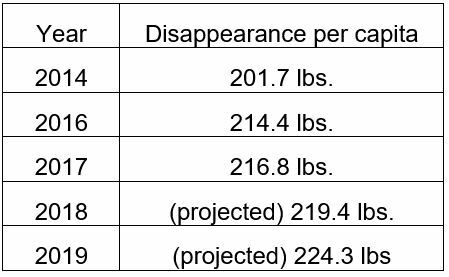 A few weeks ago this calculation was in the negative territory. With the line “The further they go the better” it doesn’t take a rocket scientist to know where this is going. A full scale attack on meat-pork producers by an elitist liberal magazine bent on social engineering society into their perception of what we all should do. Individual freedom and choice is not what elitist want, they want to moralize a change of human behavior and choice in their elitist image. The Economist highlights Peter Singer, Princeton University – “Mr. Singer argues the treating of humans as superior to those of other animals is a prejudice analogous to treating men as superior to women or whites superior to blacks”. Mr. Singer writes “The animals are our equals”. Note: Mr. Singer is at Princeton not Iowa State. In Great Britain polling indicates 1.05% of the population is Vegan, much lower than they expected. In the U.S.A. 0.5% vegans and 3.4% for vegetarians. Not exactly big numbers of consumers is it? Some reports have U.S. at 10% vegan-vegetarian. Facts don’t really bear it out. Sure wonder how companies think they can chase such a small market. The Economist cites Celebrity claims of veganism as signs of a popular reality. They include former democratic President Bill Clinton and his vice-president Al Gore, plus Serena Williams, Beyoncé etc. Just wondering if Mr. Clinton or Mr. Gore were running again for President how they would handle this at the Iowa Caucuses. Imagine a Vegan President that would be interested in Promoting Pork? U.S. per Capita Red Meat and Poultry up 23 lbs (10%) over 5 years. Not exactly screaming we don’t want meat is it! Are stories on vegans and the growth in their consumption “Fake news?” Consumers vote with their money, continued growth in U.S. and Global meat consumption is a fact, we are far from Peak meat consumption. 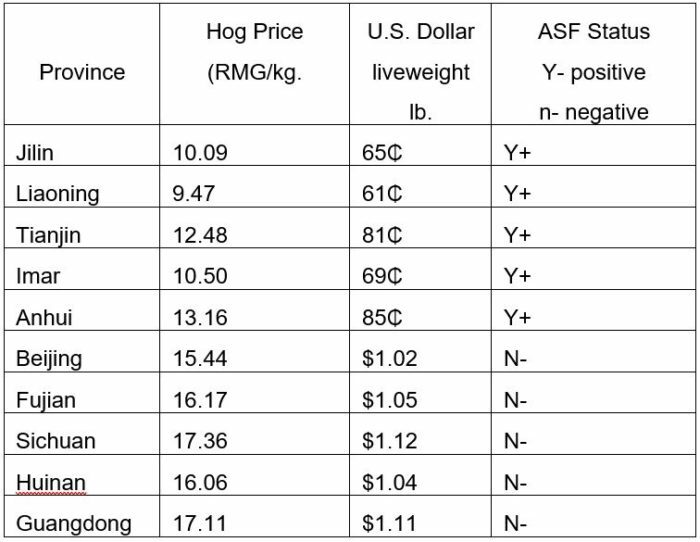 The African Swine Fever in China is a reality that has affected Global Hog Markets. A factor we believe that compounds ASF effect in China has been the liquidation of China’s sow her over the last year. China’s Ministry of Agriculture estimated China’s September 2018 sow inventory at 33 million. Down 4.8% from September the year previously or about 1.5 million sows. This in itself will lead to lower swine production in the coming months. 1.5 million sows x 15 hogs per sow per year = 22 million head. Most of China’s sow head liquidation was a result of unprofitable prices for several months. We have pulled examples of 5 provinces with ASF and 5 without. Part of the reason there is such a difference is restrictions of moving pigs out of ASF provinces. It’s not hard to figure up to a $100 U.S. per head difference. Huge financial incentive for people to break transport rules. China’s challenge to control ASF is massive. So many pigs, so many locations, so many backyard farms, over 6,000 packing plants, feeding of waste human food (last week banned by government). Price differences in provinces etc. All making this a monumental task. Our Opinion: The combination of ASF and the sow head liquidation that has happened over last year will lead to extraordinarily high price points in China. We expect enhanced China pork industry. The one thing re ASF – Russia has had ASF for ten years. Hog producers there have made extraordinary profits over that time. PRRS has killed more pigs in Russia than ASF has.